Nowadays, Lace closure is quickly becoming bare necessities of everyone in the worldwide. The flexibility and versatility of closure make them applicable for just about all types of hair. You will have a suitable lace closure if you listen our guide. How to care for your lace closure? You will question that: “How to care for your lace closure?”. Therefore, now, we will provide you our answer. Make sure you sew the closure down tight and flat. If it’s loose, it will not look right. Always check and make sure the closure is not twisting out of place while you are sewing it down. Gently swish your closure when washing. Do not rub or twist. Do not brush or pull hair while wet, as this will loosen the knots. And, you have to wash and condition using moisturizing products. Understanding, for curly hair, we recommend a small amount of a daily moisturizer such as coconut to combat dryness or frizziness. Last, be careful with chemicals, dyes, rinses, and bleaches because they would damage your natural hair. What are LaylaHair extensions made of? When you want to select a perfect hair you always will have two choices between Lace closure and Lace frontal. Therefore, today we will provide you with a lot of information: “what is a big difference between the two?”. 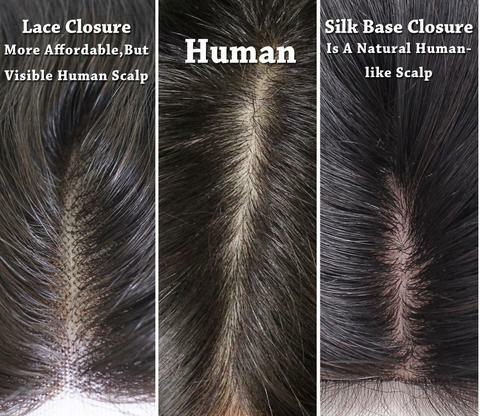 The big difference in Lace Closure and Frontal is the construction the materials used, and how they are applied. Generally, Frontals and closures can use to make wigs or to increase the volume of your hair. A closure is used for sewing in installations. If placed properly behind the hairline it can allow the wearer to wear a full weave with no hair left out while giving the appearance of a natural scalp area. But, Closures do not run temple to temple. Instead, they are placed in the “horseshoe” area at the top of a weave to close off the style. Closures designed with a durable base to enhance the finished look of your hair. Lace & Frontal closures will require some minor work to achieve a natural appearance. (Bleaching knots, the addition of an of a flesh colored fabric under will help to add the look of a natural scalp to this style of closures). As the lace closures, frontals will also require some minor work to achieve a natural appearance. (Bleaching knots, the addition of an of a flesh colored fabric under will help to add the look of a natural scalp to a frontal). The most popular method for installing closures is by sewing the closure then installing the rest of the weave around the closure. Last, we want to say that: your hair is very important to you and you have to find for yourself a suitable hair. And, Lace closures will help you. We will provide you with the best suggestions if you need.